This is a game that both parents and kids will enjoy! It could enhance kids' imagination and creativity by simulating different roles! No rules, more fun! This is a play house game that parents and kids will both enjoy! It could enhance kids’ imagination and creativity by simulating different roles! At the same time, their language expression will be improved immensely through the creation of stories! Listen to your kids and enter a magical world! Kids love to play different roles and stimulate what they see in real life. This play house game gives them an unique interactive experience! No rules, more fun! Kids could interact with everything in each room and tell stories of their own. What’s Purple Pink the Bunny’s day like? Does she want to watch some TV or play piano? Will she host a party in the kitchen? How about a barbecue party in the garden? Oh here is a secret! You could even catch fish in the pond! There are so many ways of playing! In this version we have 4 rooms and 5 characters! 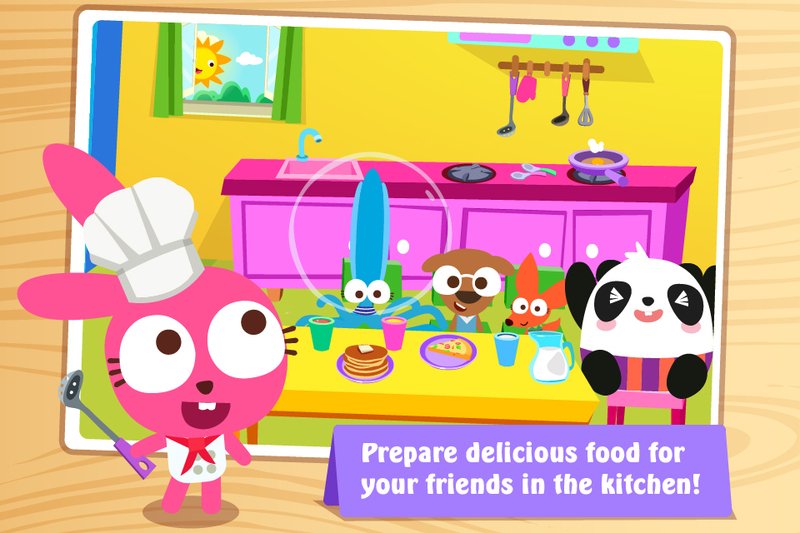 1.Play with 5 forest friends: Purple Pink the Bunny, Luca Dog, Octopus, Panda and CoCo Fox! 2.Garden: Full of surprises! a trampoline anyone could jump on, a tree house with gifts and balloons, a pond full of fish and a barbecue grill! Kids love to play here the most. 3.Living room: watch some cartoons on TV, play piano, sit on hanging chair or simply find cute accessories to dress up your favorite characters! 4.Kitchen: Girls’ favorite! Cook a feast with many vegetables, fruits and food in the fridge or clean up the dirty dishes? Keep busy! 5.Bedroom: Click the sun to let it down. When the moon rises, time to go to bed! There are fun toys like bubble machine, blocks and a doll house! 2.More than one hundred interactive items! 5.Looking for surprises and discover hidden tricks! 6.No Wi-Fi needed. It can be played anywhere! This version of Papo World Play House is free to download. Unlock more rooms through in-app purchase. Once complete the purchase, it will be permanently unlocked and bound with your account. Papo World aims to create a relaxed, harmonious and enjoyable game play environment to stimulate children's curiosity and interest in learning. Focused on games and supplemented by fun animated episodes, our preschool digital educational products are tailored for children. Through experiential and immersive gameplay, kids could develop healthy living habits and arise curiosity and creativity. Discover and inspire talents of every child!